The recent death of Robin Williams, whose talent no superlatives can encompass, plunged me into a deep well of grief and memories. I never knew Mr. Williams personally, but I know his reported illness intimately. The constant threat of depression haunts my days. Like the genius who made us laugh and cry, I have been tempted more than once to take my own life to end my pain. "Give light to my eyes, or I will sleep the sleep of death." 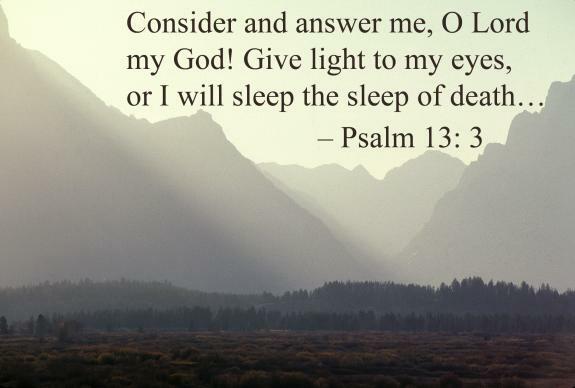 Could the psalmist have written any clearer cry for help? • Be fully present to the person in need. Profound feelings of worthlessness and hopelessness are the biggest threats of depression. Your attention will help dispel these feelings. If the person allows you, hold a hand or give a hug. Physical touch can break through a depressed person's isolation. • Don't judge. Depressive illness isn't the result of sin. • Don't try to "fix" the person. Just listen and reassure them that they're not alone. • If you or someone you know is expressing suicidal thoughts, call the National Suicide Prevention Lifeline, 1-800-273-8255. If it seems the person may harm himself or herself immediately, call 911. Robin Williams' death has thrown renewed light on the struggles of those who have mental illness and the social stigma we face. I have read countless books and articles on its nature in learning to manage my disease. Some people seem to be genetically disposed toward it, as I think my family has been. Some people develop depression while managing another chronic medical condition such as heart disease or diabetes. Elderly people often become depressed as their bodies fail and their family and friends die. Teenagers enduring hormone fluctuations can have depression. Children who've experienced trauma can get it. In short, no human, even a faithful believer, can be considered immune to this insidious disease. The psalmist's words confirm that depression has been with us since the dawn of recorded history. We are all vulnerable. The question is whether we will allow ourselves to be vulnerable enough to ask for help. I am among more fortunate depression sufferers because I've found that regular spiritual practice, such as prayer and devotional reading, equip me to recognize when an episode is upon me. Because I've exercised my "spiritual muscles," sometimes I can push back depression's isolation and hopelessness to experience God's presence. In fact, my favorite affirmation of faith has become No. 883 in the United Methodist Hymnal, with its stirring conclusion: "… God is with us. We are not alone. Thanks be to God!" I've also been fortunate that the United Methodist congregations of which I've been a member have shown me hospitality, compassion and spiritual care when I needed it. Such spiritual care can take many forms, but I must stress that one cannot "pray away" depression (or any other medical condition, for that matter). Nonetheless, I've found that my depression can benefit mightily from what we call "a ministry of presence." That's because depression can be stealthy; an episode can sneak up on us sufferers before we realize it. During an active episode, we people with depression frequently lack the capacity to reach out for help. We need others to watch over us, to know the signs of depression and to be willing to get past their own discomfort with mental illness to ask us how we're feeling. To me, this seems like a perfect calling for the church of Jesus Christ. I wish with all my heart that Robin Williams had had a spiritual community supporting him during his soul's dark night. I wish that someone, something, could have shown him God's loving presence before he took his own life. Once upon a time, his manner of death easily could have been mine. I am so grateful that God, my family and friends, and good medical care, have helped me survive! Astle of Dallas is a longtime United Methodist communicator, a certified spiritual director and a member of St. Stephen United Methodist Church in Mesquite, Texas.